The lectionary is only intermittently committed to the narrative line of Scripture. This Sunday, the Third after Epiphany, brings us back to Luke (specifically Luke 4:14-21), but we’ve skipped an important bit. Two weeks ago we had the Baptism of the Lord from Luke, but we jump right past his temptation in the wilderness, the great test that empowered him to begin his public ministry. Have no fear: in each year of the lectionary the story of Jesus’ temptation is skipped after his baptism, only to be jammed back in on the First Sunday of Lent. The people behind the lectionary cared even more about matching texts to the liturgical year. But that scene we skipped, Jesus’ battle with Satan, is what sets the story up for the “Then…” of verse 14 when Jesus began his teaching in the synagogues of Galilee. That is, Jesus came to his teaching ministry not only having taken the symbolic action of receiving John’s baptism. He also came with the sense of personal victory over the demonic world. Well the Messiah has finally come. And it’s our own Jesus! Aw… I knew him when he was just a kid. Remember that time he ran away for a week in Jerusalem? Nothing could be further from the truth. Sure he was well received in the synagogues he visited before coming back to his home town. But in Nazareth his friends and neighbors responded to his message by trying to murder him. Again, fear not: the story will conclude next week — we’ll see the attempted murder, but we’ll have to remember for ourselves just how the argument got started. So, what do we find in this perhaps oddly cut and oddly set gem of a text? First we see that people just love Jesus. This story rings one of the deep supportive bass notes underneath the rise and fall of stories carrying the melody of the Gospels. Most people thought Jesus was just fantastic. They wanted to be around him. We got the first hint of it when Jesus was a boy of twelve. Luke told us that as he grew he enjoyed the favor or both God and the people (Luke 2:52). We see it throughout so many stories when he healed all who came to him, and when crowds anticipated his movements, arriving at his destinations before he did. We see it on Palm Sunday when the crowds waved their palm branches and acclaimed his arrival. And in a quiet but powerful way we see it in the simple fact that children wanted to be near him. So in this passage, as he traveled around, teaching in synagogues, he “was praised by everyone” (Luke 4:15). Second we see his confident awareness of himself as the Messiah. 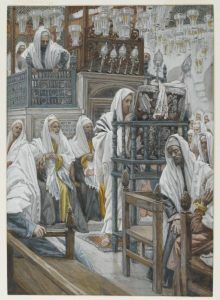 Jesus, in his home synagogue, receives the honor of being called upon to read from the Scriptures. In later centuries at least, the five books of Moses were divided into a yearly cycle of readings, and a passage of the Prophets would be appointed as well. In this scene it is unclear whether the passage from Isaiah was a lectionary reading assigned in advance, or whether Jesus opened the scroll to read the passage he himself had in mind. That’s the only part of the sermon Luke preserves for us — possibly it was cut short by the kerfuffle featured in next week’s text. But cutting the text at this point leaves us with a very strong emphasis — as strong in its way, really, as the “I Am” sayings in John. But while John’s “I Am” sayings add together to make a strong claim to Jesus’ divinity, this passage in Luke proclaims instead his “anointed-ness,” his Messiahship. The interesting thing to me is the way the passage resonates differently in the narrative and in our reading experience. Within our minds as readers, especially those of us who have been Christians for decades or a lifetime, it is a message which we see as proof of his Messiahship. It is all in our past tense. We’ve seen Jesus do these things already. Within Luke’s unfolding story, Jesus uses the Isaiah passage to proclaim who he is and what he is about to do. It is all in Jesus’ future, with a gospel full of examples yet to come. Seeing it within the flow of the story makes it all the more bold. Jesus, full of the Spirit and fresh from his victory over Satan proclaims something no one has seen the slightest evidence of. He claims (without basis for all they knew), that he is the promised Messiah, and that he’ll shortly be preaching good news, freeing the oppressed, and offering miraculous healings — and that is shocking enough to spark the violent reaction the lectionary put off till next week. Love your insight and wit (kerfuffle…HA)! Miss your seminary classes – yes, even church history-appreciate it much more now. Thanks so much Nea! Great to hear from you. Hope you’ll let me know sometime how life and ministry have unfolded for you.